The first recording that Neil Hannon and his band made in a studio, October 1st may be one of the rarest items of the Hannon works with the following album Exposition. 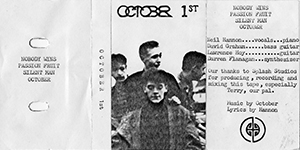 It was the days before The Divine Comedy when the band was called October and had a different line-up. 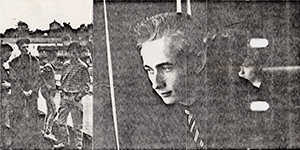 Neil Hannon was accompanied by his mate Lawrence Hoy (guitar) as well as two other boys from the Portora Royal School, Enniskillen: David Graham (bass) and Darren Flanagan (keyboards). The EP was recorded at Splash studios in Belfast on 28th & 29th November (?) 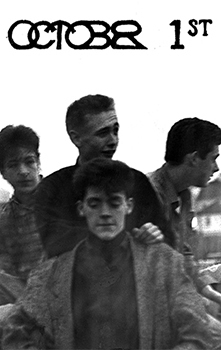 1987 with a Boss DR-220A drum machine they just bought in Belfast (the band had no drummer yet). When listening to the recording it’s pretty obvious that the band had a perfect idea of what they were doing. Despite that it’s the first recording of a teenage band, do not expect to hear some jamming. At that time Neil had already studied music and was scoring all his song, and came in the studio with all parts scored despite the other band members had no understanding of music notation. The photo on the front cover was taken by Neil then-girlfriend Dianne Moore and developed in the Collegiate Grammar School of Enniskillen (Neil was at the Portora Royal School); it shows the band sitting beside the River Erne in front of the Enniskillen castle. The back of the sleeve shows a photo of Neil Hannon as well as a photo of the band which reminds U2’s October front cover. The front cover of the sleeve was actually not printed on the other side (the band printed themselves the sleeve with the help of Neil's father's photocopier) and so features 4 paper strips (probably for a better folding). One with the tracklisting, one with the title, one with the credits and one with the front cover. A first version of the sleeve were also designed with drawings by Neil Hannon but has not been released, while the band members had signed copies by Neil of the regular sleeve. The EP was sold to £3 by the band themselves mostly to schoolmates and people in Enniskillen and was advertised in music shops. Some copies were also sent to local DJ. On both side is stuck an artwork with the title and side number. The cassette itself features the same recording on both sides. The tapes were actually 60 minutes Memorex DBS (Type I) cassette, so the 20 minutes long EP fits on each side. They were actually copied from a couple of original cassettes the band got when leaving the studio. God only knows whatever happened to the original recording, at the time the small studios used to re-use the masters tapes.